When I looked in my closet I couldn't find any white dress shirt, so I was looking to buy one. H&M has a variety of clothes and they usually have high quality shirts. Turns out I was right! 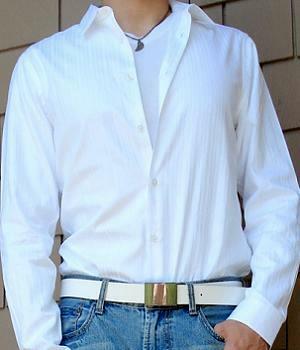 This slick white dress shirt immediately caught my eyes due to its unique and elegant design. I tried it on and looked at the price tag and brought it to the checkout counter! 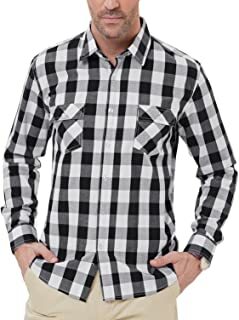 This men's dress shirt is very special: it is actually a "white striped" shirt considering it has one set of white stripes and another set of stripes of a different shade of white interleaving one another, showing gradations of the white color in a gorgeous way. When you put it on it just screams style and class to those who see it. It is too good not to have it. The low price is just icing on the cake considering its counterparts can run over $100 in many other stores! 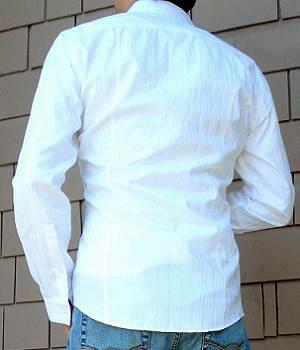 This is a dress shirt and is mostly worn in formal attire tucked in. However in a semi-formal occasion you can leave it out just like the photo and you'll still look great. 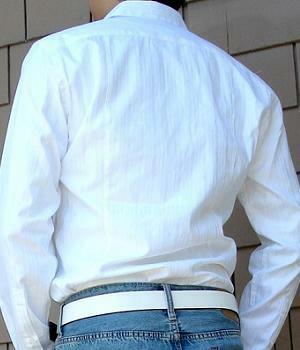 A white shirt goes BEST with a pair of light blue jeans. The two colors just complement each other very well. You could wear a pair of dark blue jeans but the combination usually wouldn't bring out the best in each other as the former combination would. In formal attire simply tuck it in black dress pants and you are all good. To be honest it might not even matter what pants you wear because people's eyes will be all over your shirt!